You need more than just a good knowledge of the hotel industry to become successful in hotel manager in Bangladesh. Not only this but you also need to develop excellent management, time management, interpersonal and research skills, and good interpersonal skills. Although a good hotel manager knows how to delegate, always keeps a close eye on every aspect of the business like kitchen, service, cleaning, maintenance, front desk etc. Also, you need to become a good communicator and to actively seek information about what’s going on in the hotel, the industry, and in the wider society if you want to be successful in this career. And you’ll keep a very close eye on every aspect of the business as a good hotel manager. So, if you have these qualities then you must be successful in hotel management. You should think about the jobs when you’re a hotel manager in Bangladesh and for you is that there are job opportunities might also be found in other accommodation and tourism businesses, including resorts, health farms, cruise ships, inns or motels. If that’s where you want to go then any of these can also provide a pathway to a position in a large hotel. Apart from these, other opportunities may exist in the non-profit sector. These may include, for example, hospitals, aged care centers, orphanages, women’s refuges or refugee centers. A qualification in hospitality or sometimes, in management is one of the common career paths in this industry through education. Although this can start you off with sound skills and knowledge, you can apply while gaining necessary experience. And with suitable qualifications and experience, you might later go in a completely different direction. In addition of these, there is another career path through an experience where you can find work in any area of a hotel and work your way up if you can demonstrate your commitment, abilities and personal qualities. As those people will be thoroughly trained in that hotel’s ethics, standards and procedures, many top hotel chains prefer people to work their way up at the hotel. So, while starting with any job in a hotel you can start your career of a hotel manager in Bangladesh. 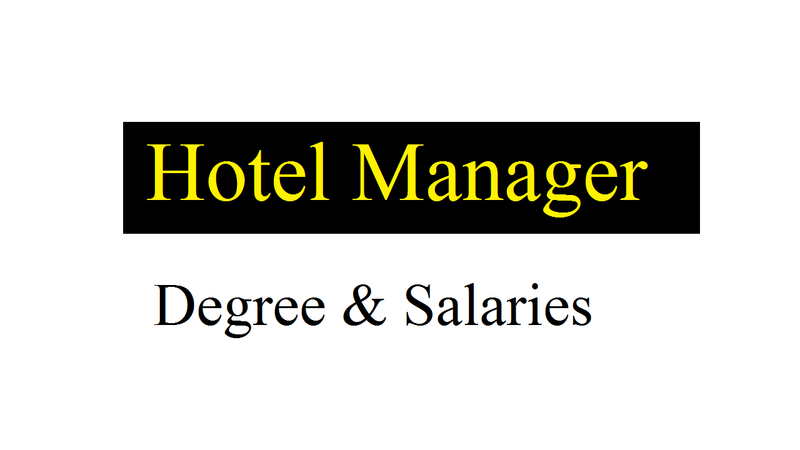 You need a bachelor’s degree in hospitality or hotel management if you want to be a hotel manager in Bangladesh. Also, you may be hired with an associate’s degree or a certificate in hotel management if hotels with fewer services and less complicated operations. Besides, there are many types of lodging and the salaries vary according to industry, level of responsibility and geographic location. Although hotel managers earned a median annual income of $51,840, the bottom 10 percent of earners in the field earned around $28,870, while the top 10 percent earned over $96,570. On the other hand, hotel managers in larger establishment earned the most, with an average annual wage of $98,570. Hotel managers may be assigned different roles and tasks by different employers while giving the differences in kinds and sizes of hotels. And in this case, a hotel manager in Bangladesh may be assigned different roles and tasks by different employers. When they are coordinating their activities with those of managers in other sections and someone may manage only one section of a hotel. While the deal with the many problems that arise in this business, you’ll continually monitor guest satisfaction. And if the guests are satisfied then you’re going to the top with your hotel management soon. Well, let’s know some steps to become a hotel manager in Bangladesh. When some people say don’t bother, some other think hospitality degrees are worth it. Before sinking a lot of money into a hospitality degree, you should consider a few important factors. But, a degree might be necessary to separate yourself from the pack for some of the most coveted hotel management jobs. As plenty of colleges offer courses in hotel management programs, the best way to find out what type of degree your hotel values the most is to simply ask. Also, those who have produced hotel managers for them in the past, they may have a relationship with a college. If you think a hotel management is a job that students land right out of undergraduate school then you’re in the wrong. In a series of increasingly responsible positions, most properties prefer managers with on-the-job experience. For example, a desk clerk might get promoted to chief room clerk and after that front office manager, sales and promotion manager and finally, a hotel manager in Bangladesh. Although employees who show leadership potential and have several years of experience can sometimes move into assistant manager jobs, employers typically reserve management-training spots for college-educated candidates. So, you should look for experience through part-time summer jobs and internships as an aspiring hotel manager. Slower than the average growth of 7% for all jobs, jobs for hotel managers will grow 4% from 2016 to 2026, according to the statistics. The hotel sector will move toward more limited-service properties with fewer amenities and features to manage as the tourism industry will expand. Apart from these, hotel operators are scaling back on management to slash costs. As there are fewer competitors for management openings, employment prospects will be best at smaller hotels. If you can become an apprentice or if they provide some form of leadership training then going the extra mile can include directly asking the current management. When you want to make the hotel better and will more than likely try to accommodate you, management will love seeing that. If the apprentices complete a six-week rotation through each department in a hotel then they choose a department to focus on for about four months. They make a presentation to the executive committee after the apprenticeship ends and even receive a certificate that is recognized across the industry.